The Super Bowl may not be as big of an event as World Cup is to us Singaporeans, but that doesn’t mean the Super Bowl is insignificant. adidas and BAPE® have teamed up and released a football-inspired capsule collection created for the Super Bowl, America’s biggest sporting moment of the year. Combining both streetwear and football culture, this collection features A Bathing Ape’s (BAPE®) signature camo print on a range of adidas apparel, including football cleats, football jerseys and hoodies. Take a look at these trendy pieces and get ready to catch the Super Bowl! 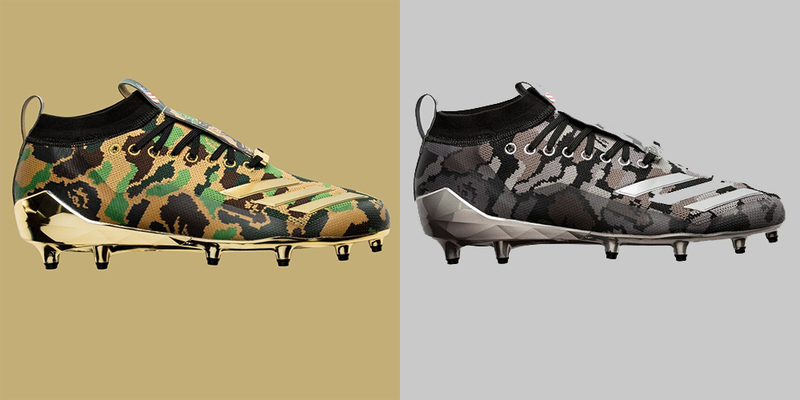 The adizero brings adidas’ football cleat silhouette and BAPE®’s camo print together, elevating it to the next level. With a redefined fit, feel and lightweight construction, this pair is sure to be stylish and comfortable. By offering style, comfort and high-performance technology, the adidas by BAPE® UltraBOOST is guaranteed to give you the ultimate running experience. The adidas Primeknit upper provides adaptive support and comfort while the BOOST technology gives you the most responsive, energy return cushioning ever. Made of middle weight double knit fabric with mesh lining, this hoodie offers you both comfort and style. 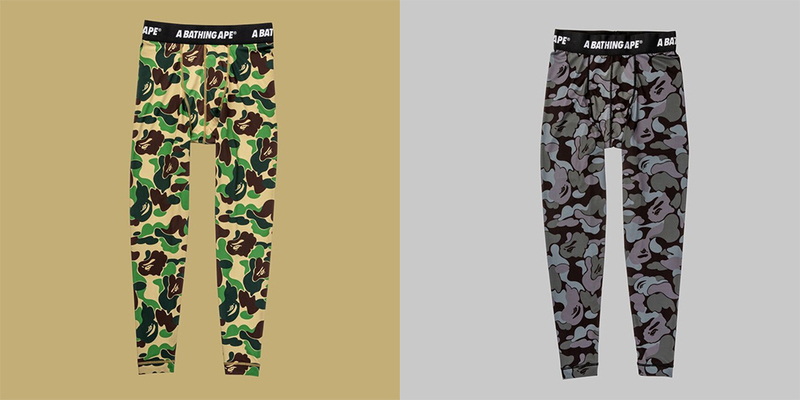 It features BAPE®’s famous ABC CAMO print, BAPE®’s shark graphic on the hood, the BAPE® and adidas Badge of Sport branding on the left and right chest and three stripes on the sleeves. 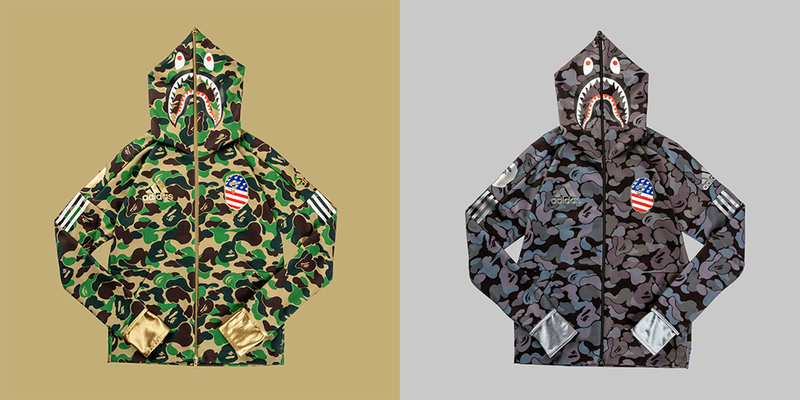 BAPE®’s head logo is seen on the shoulders while adidas’ iconic three stripes can be seen on the arms. 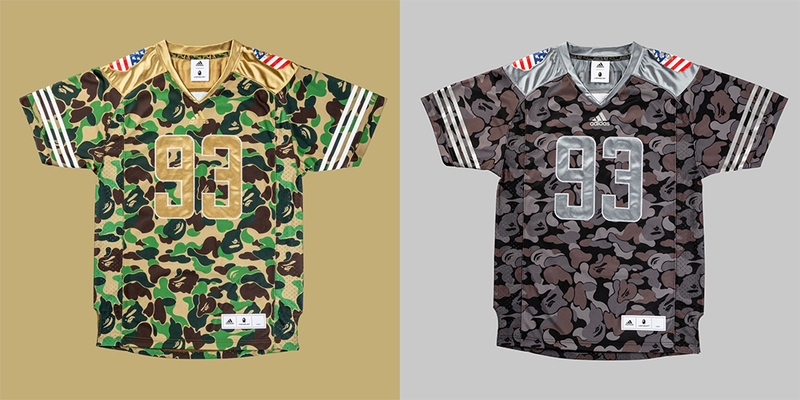 The number ’93’ on the front and back of the football jersey represents the year BAPE® was founded. This pair of training tights was made to wrap the body and support dynamic movement, giving you a locked-in and stretchable feel. The APE head logo and adidas Badge of Sport branding add detail to the back hem of this pair of camo print training tights. The pair of gloves features BAPE® camo print and oversized shark graphic. With a seamless GripTack palm, this pair of gloves is sure to give you consistent grip and control, rain or shine. The helmet, though only for promotional use and not intended for play on field, is a collectible that can’t be missed. It features a custom BAPE® camo print film that’s been hand-dipped, applied with hydrographics with a high-gloss, clear coat finish. What is Super Bowl without a football? The adidas by BAPE® Football is handmade in Texas and features BAPE® camo print, as well as metallic gold panels. The limited-edition adidas Football by BAPE® capsule collection will be available online and at BAPE® stores from 2 February 2019. 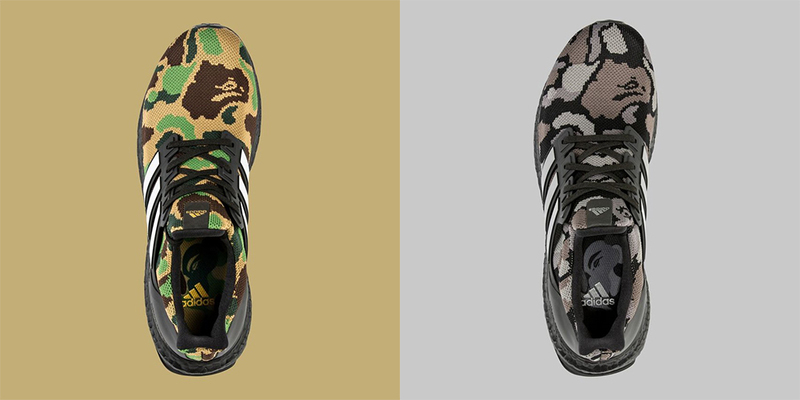 Note that for the black camo print, only the Ultra Boost will be available to Singapore consumers online.